Though this Update was meant to enhance the quality of the Operating System but this has also caused a lot of problems to users who installed it because of some configuration error or might be due some changes. Getting this KB3201845 has brought many glitches that ranges from excessive battery drain issue to Windows Explorer bugs and many more which is creating a bevy of errors. Still there is no possible workarounds from the makers but few errors can be fixed with some simple tweaks. 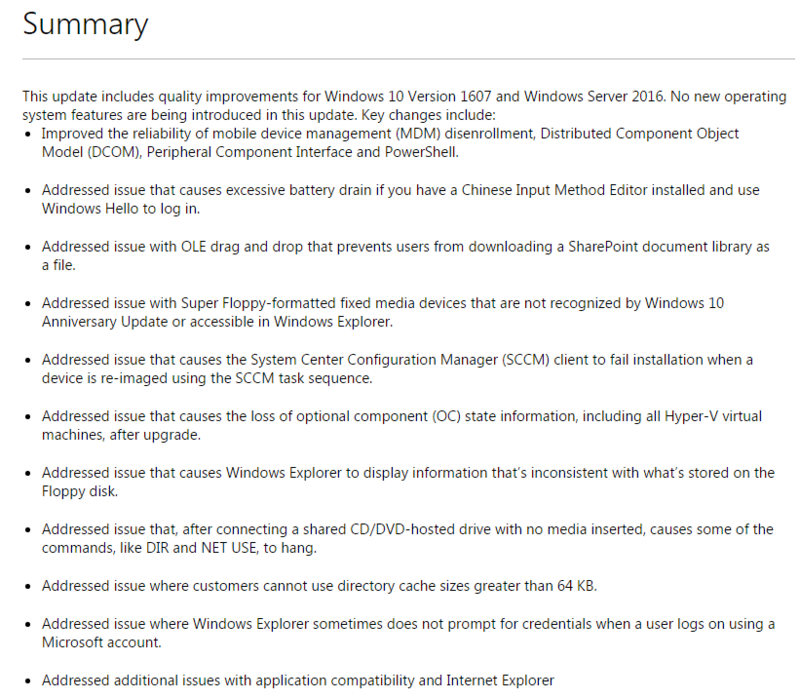 Here are some of the bugs that have occurred due to the Windows 10 Update KB3201845 and the workarounds for them.. Many users are not able to install the latest update KB3201845 on their personal computers/notebooks. If you are among them then consider yourself lucky for this technical error as it is a blessing in disguise. Many users are actually stuck into a never ending loop which causes successive restarts and failure of install failure messages. Since it is not able to take the update rather wait for few days until Microsoft announces or wait for next month when a new update comes. It has also been encountered if KB3201845 is installed then at times the screen goes BSoD (blue screen of death) with message of “INACCESSIBLE BOOT DEVICE and WDF VIOLATION”. This may happen due to some changed configuration during installation or it might not have been completed properly. I would suggest uninstall the update and again reinstall or better keep your computer away from this update. After installing KB3201845 has also corrupted the Google products installed on Windows 10 PC. Google chrome, calendar and few apps aren’t working. Uninstalling the update also doesn’t helps. This update has also affected some Windows apps and programs and creating an issue while launching them. High CPU usage is caused due to “Service Host: DCOM Server Process Launcher” which is happening after the update. Try to reset the Windows 10 Store using the WSreset.exe. If it isn’t working then uninstall and re-install your Windows 10 store using the Powershell command. The Update is not only limited to the interruption in above mentioned areas but also impacts connectivity issues. Users complain that Bluetooth controls are missing and Bluetooth has stopped working and also that Bluetooth is missing from the Device Manager. The Airplane mode has also stuck and has become unresponsive. Either troubleshoot or Re-install the Bluetooth drivers and check this is working or not. If not then try using System Restore so as to restore to earlier point when your system was healthy and working fine. 1. Settings app is not opening. It has happened for some users and they are in dilemma. Don’t panic just wait for another update to arrive. 2. Directx 12 crashes due to this update KB3201845. Try uninstalling the update and it might help. 3. VLC along with other apps are getting unresponsive due to this app. 4. Start Menu in Windows 10 is also getting unresponsive at times. Though this update wasn’t successful as it was supposed to be but Microsoft must be busy in mending these and will soon be out with better updates so as to make up for the bugs it has caused with this update. Sometimes you may get Windows 10 Update KB3201845 due to several issues. However, you can easily get rid of this error with an ease. This issue can be fixed with the help of above solutions and get rid of this issue forever. All these solutions are very easy to perform and you can try these solutions even without any help of technical support. However, if you fail to fix this issue then you can try PC Repair Tool. This tool is able to fix all the PC related issues and speed up your PC easily. 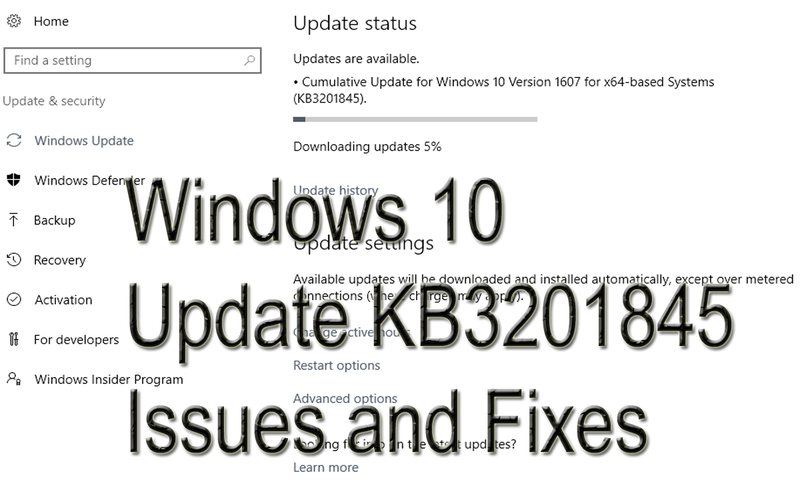 Recently Windows 10 Update KB3201845 was released by Microsoft which created many bugs and Issue are mentioned in this blog. Try all the solutions mentioned here to fix this update issue.